Every other week The Maitripa College Podcast features teachings, conversations, and highlights from our degree courses, community programs, and archives. Join us in listening to and learning from some of the great contemporary Buddhist minds in America today. Maitripa College is a Tibetan Buddhist graduate school in beautiful Portland, Oregon, offering a Master of Arts in Buddhist Studies, a Master of Divinity, Classical Tibetan language study, continuing education courses, and community programming. We invite you to subscribe using the buttons on the this page and thank you for listening! In this second session of a two-part talk, Maitripa College visiting faculty member Roger Jackson, PhD, shines light on the continued relevance of the teachings of Tsongkhapa over centuries and across continents. 2019 marks the 600th anniversary of the passing of Tsongkhapa, one of the greatest figures in Tibetan Buddhist history, and is an appropriate occasion to examine his remarkable life and contribution to religion, philosophy, literature, and society. Throughout the talk, Professor Jackson presents Tsongkhapa as a complex figure: the founder of the Geluk school who studied with masters of all the traditions of his era; a respected intellectual who also had a rich inner life; a prolific author and lecturer who spent as much time as he could in retreat; and a master very much of his own time and place who nevertheless remains relevant in our 21st century world. Roger Jackson, PhD, is a visiting faculty member of Maitripa College and is Professor Emeritus of Asian Studies and Religion at Carleton College. He has nearly 30 years of experience with the study and practice of Mahamudra and was trained under Geshe Sopa and other great Tibetan Buddhist masters. His special interests include Indian and Tibetan Buddhist philosophy, meditation, and ritual; Buddhist religious poetry; religion and society in Sri Lanka; the study of mysticism; and contemporary Buddhist thought. Jackson’s manuscript, “Mind Seeing Mind: Mahamudra and the Geluk Tradition of Tibetan Buddhism” is forthcoming this year (2019) from Wisdom Publications, Series in Indian and Tibetan Buddhism, and is being read in a Mahamudra graduate seminar with Yangsi Rinpoche and Dr. Jackson at Maitripa College in Spring 2019. He has published numerous books and articles about Buddhist thought, and edited other volumes and journals. To name but a few, he is author of Is Enlightenment Possible? (1993) and Tantric Treasures (2004), co-author of The Wheel of Time: Kalachakra in Context (1985), editor of The Crystal Mirror of Philosophical Systems (2009), co-editor of Tibetan Literature: Studies in Genre (1996), Buddhist Theology (1999), and Mahamudra and the Bka’brgyud Tradition (2011), and has published many articles and reviews. He is a past editor of the Journal of the International Association of Buddhist Studies, and is currently co-editor of the Indian International Journal of Buddhist Studies. 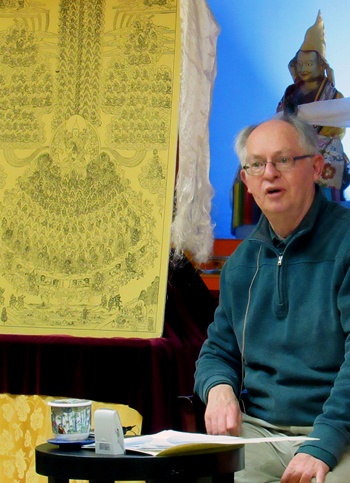 Roger has a respected history of great scholarship and was trained by Geshe Sopa in Wisconsin. He brings to Maitripa College a long career of teaching and interacting with Buddhist Studies scholars in the West, as well as a close connection with many great Tibetan teachers.